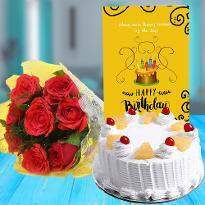 The enthralling beauty of flowers and appetizing taste of the cake is the best combination with which you can surprise your near and dear ones on any occasion or celebration. 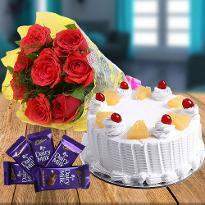 It's the perfect combination of love and sweetness wrapped in a gift hamper and it's sure to steal the heart of the receiver. 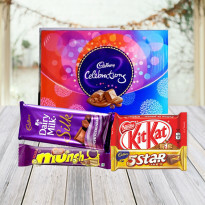 We have a vast collection of cake, flowers, chocolates and many other lovely gifts that can enliven any occasion. 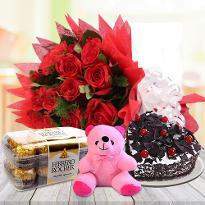 Shop from a plethora of gifts and select the appropriate one for online delivery. Bangalore the Air Conditioner city of India. Bangalore enjoys the not so cool not so hot weather all year along. The best thing about Bangalore is the weather. 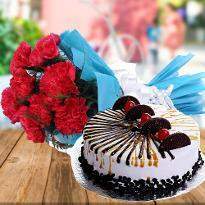 Let’s have the full enjoyment of the surroundings with the scrumptious cakes from Winni. 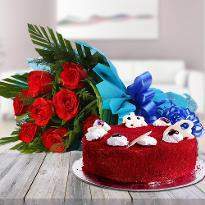 Winni offers online cake and flower delivery in Bangalore to have the super delectable treat for the city. With every best thing there comes the worst also and in Bangalore, the worst part is the traffic. The traffic jams in Bangalore are one of the major deal breakers in celebration. 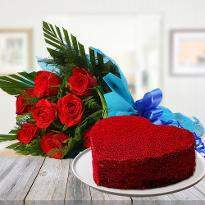 Now Winni is here to save you from the hustle, have cake and flowers home delivery in Bangalore. With lots of traffic comes lots of pollution. In between this mess, something that can bring freshness to life is the flowers. 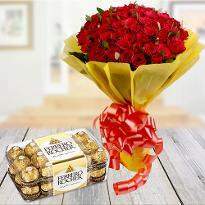 Have the flower bouquet delivery in Bangalore with Winni and freshen up the souls. Along with traffic, there comes a lot of crowds and if you are staying in Bangalore then you might be having a huge circle. In the city like Bangalore sometimes it becomes difficult to stay in personal touch with each and every person of your circle. 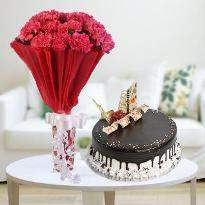 We offer you the chance to send all your wishes to your peeps with best flowers in Bangalore. 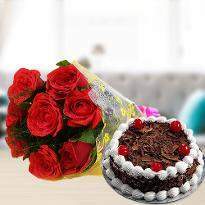 Flower bouquet will not only keep you in touch with your people, will also create some memories for life. Traffic can no more invade in the bonds. Winni have a huge range of products. Quality is our assurance. 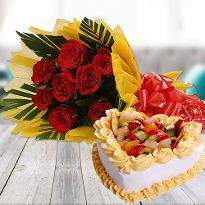 With the wide range of cakes and flowers delivery, Winni believes in spreading joy. 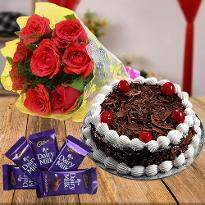 We have products categorized in different categories like eggless cakes for the people who are pure vegetarians, the huge range of chocolate cakes for the chocolate lovers, these chocolate cakes are paired with colorful flowers to bring the colors to the sweet atmosphere, the flowers of love like roses are available in different colors like pink roses, red roses, white roses. 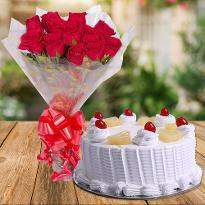 Flower bouquets with different number of flowers like 20 roses, 15 roses and the cakes of different shape like round cake, heart cake along with the different weight options like 500gms cake, 1 kg cake and much more. 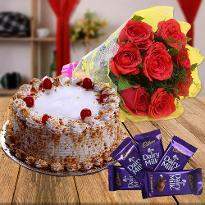 The combo of rose with the delicious fruit cake can charge the atmosphere to the next level. 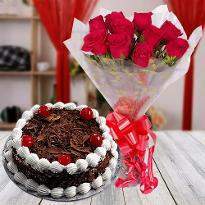 Many more combo of cakes and flowers are available for every occasion and situation. Midnight celebrations have taken a rabbit leap in these years. Nowadays for every occasion midnight celebrations have become must celebrate. With midnight celebrations we celebrate the special occasion at the very first minute of its starting. Bangalore is oldest and largest IT hub of the country. City of youth, place of celebration and much more can be its alternative names. 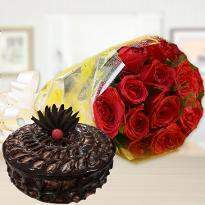 Light the rim with midnight cake and flowers delivery in Bangalore. 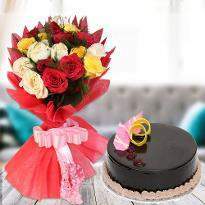 Winni provides midnight cake and flowers delivery almost across all the areas of Bangalore. 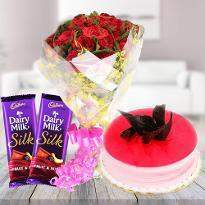 Not only the combos of cake and flowers, we do provide Mother's day gifts delivery in Bangalore. 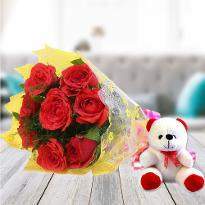 Midnight flowers delivery in Bangalore to give a fresh start to the new phase of life. 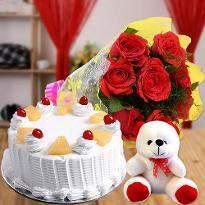 Anniversary Cakes, Birthday cake, New Year Cakes or immediate cake delivery in Bangalore is preferred for midnight delivery. Because these are the days which tell us that we have completed the wonderful journey of certain years and will have much more to cover. 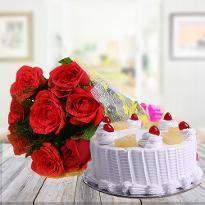 You can have the personalized cakes as well as flower bouquet with the number of accomplished years of your journey. You can also have customized cakes for the particular celebration. Flowers are the natural aromatic magical spells which can instantly fill souls with freshness. A beautiful flower bouquet not only brings wonders to surprise it leaves a soothing impact on receiver’s eyes. It gives us the example of beautiful God's creation. 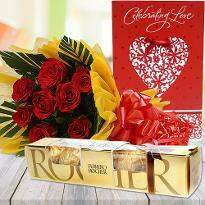 A surprise flower bouquet delivery in Bangalore is no more a task to accomplish. Winni celebrates relations and values emotions. 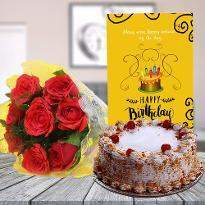 Send flowers to Mumbai from Bangalore because Winni is offering you a wide range of flower combos.With flowers, you can now send cakes which add sparkles to the day. A surprise cake delivery in Chennai from all the way to Bangalore was never so easy before. Winni is building relationships all across the India to make bonds stronger. 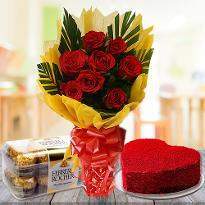 The best part will be when you will have the combo of the cake and flowers home delivery to your people. 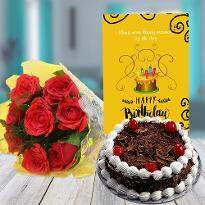 The personalized combo with the cake of your taste packed with the beautiful flowers of your choice. Cakes are special in their own way. They become more special when they are customized as per the occasion or the choice. You are organizing a party and you and all your friends want to have certain revolutions too. The best way to say it loud is with a customized New Year cake. With every single bite explain your plans and people will be amazed at your delectable plans. Winni also offers precious flower bouquets. With these bouquets, you can choose the color of flowers or the type of flowers you want to gift. With these special flowers pour your heart to all the lovely people in your life. Winni covers almost all the areas of Bangalore of home deliveries. Here are some areas of our coverage. Mahadevpura, Indira Nagar, MG Road, Banashankari, Hodi Circle, ITPL, Electronic City, Bannerghatta Road, Domlur, Yeshwantpur, Hebbal, RT Nagar, HSR Layout, Doddanekundi, AECS Layout, Manyata, Malleshwaram, Rajajinagar, Vijaynagar, Adugodi, Agaram, Airport Road, Arabic College, Arakere Gate, Ashok Nagar, Austin Town, Balaji Nagar, Marathahalli, Bellandur, Koramangala, BTM Layout, JP Nagar, Whitefield, Banashankari, Banaswadi, Bangalore CBD, Bangalore University, Benson Town, Bhoopasandra, Bidadi, Bilekahalli, HAL 3rd Stage, HAL Airport Road, Hanumantha Nagar, Haralur Road, Bommanahalli, Brigade Road, Brookefield, BTM Layout, BVK Iyengar Road, Byatarayanapura, C V Raman Nagar, Carmelram, Chamarajpet, Bannerghatta Road, Basavangudi, Basaveshwaranagar, Bellandur, Chandra Layout, Chickpet, Chikkabanavara, Church Street, Commercial Street, Cooke Town, Cox Town, Crescent Road, Dispensary Road, DJ Halli, Doddaballapura Main Road, Doddanekundi, Dollars Colony, Domlur, Double Road, Ejipura, Electronic City, Cubbon Park, Cunningham Road, Dasarahalli, Devanhalli, Srirampuram Vijayanagar, Vimanapura, Virgonagar, Viswaneedam, Vittal Mallya Road, Dickenson Road, Frazer Town, Gandhinagar, Ganga Nagar, Gavipuram, HAL 2nd Stage, Haudin Road, HBR Layout, Hebbal, Hennur, Hesaraghatta, Hoskote, Hosur Road, HRBR Layout, HSR Layout, Kasturba Road, Kasturi Nagar, Kathriguppe, Kempegowda Road, Kengeri, Kodihalli, Indiranagar, Infantry Road, J C Nagar, J P Nagar, Jakkur, Jalahalli, Jayamahal, Jayanagar, JC Road, Jeevanbheema Nagar, Jnana Bharathi, K.G Circle, K.G Nagar, K.H Road, K.R Market, Kadubeesanahalli, Kadugodi, Kaggalipura, Kalasipalyam, Kalyan Nagar, Kamakshipalya, Kammanahalli, Kanakapura, Kanakapura Main Road, Konanakunte, Koramangala, Kothanur, Kumaraswamy Layout, Kumbalgodu, Laggere, Langford Gardens, Langford Road, Lavelle Road, Lingarajapuram, M.G Road, Madivala, Magrath Road, KR Road, Krishnarajapuram, Kumara Krupa, Kumara Park East, Kumara Park West Mahadevapura, Museum Road, Mysore Road, Walton Road, Wheelers Road, Whitefield, Wilson Garden, Yelahanka, Yeshwanthpur, Nagarbhavi, Nagasandra, Nagashettyhalli, Nagawara, Nandidurga Road, Nayandahalli, New BEL Road, New Thippasandra, Old Madras Road, Padmanabha Nagar, Palace Cross Road, Palace Guttahalli, Peenya Industrial Area, Puttenahalli, Queens Road, Race Course Road, Raja Rajeshwari Nagar, Mahalakshmi Layout, Main Guard Cross Road, St. Thomas Town, St.Marks Road, Subramanyapura, Sultanpalya, Malleswaram, Marathahalli, Maruthisevanagar, Mathikere, Millers Road, Mission Road, Murugeshpalya, Rajajinagar, Rajanukunte, Rajkunte, Ramanagaram, Residency Road, Richmond Road, Richmond Town, RMV 2nd Stage, RT Nagar, Sadahalli, Sadhashivnagar, , St. Johns Road, Tannery Road, Thyagarajanagar, Tumkur Road, Ulsoor, Varthur Road, Vasanthanagar, Victoria Road, Vidyaranyapura, Sahakara Nagar, Sanjaynagar, Sanjeevini Nagar, Sankey Road, Sarjapur, Seshadripuram, Shampur, Shanthinagar, Shivajinagar, Viveknagar, VV Puram, Vyalikaval.